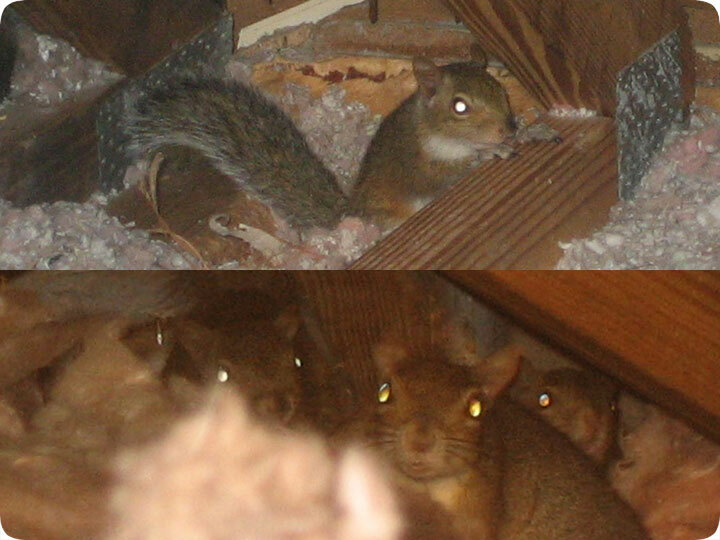 10.03.2006 - Here's a couple of squirrels that I've managed to photograph inside attics. I've already written many guides about how to remove squirrels from attics, so now I will just write about how to prevent squirrels from getting into your house in the first place. Of course, if you've found my website, it's likely that you already have a wildlife problem, but I'll write about prevention anyway. If your already have a squirrel problem you can certainly do preventative measures to prevent future problems from happening again. Step 1 - Inspect the whole house, top to bottom, and search for any possible openings leading into the house. Prime areas include the area where eaves meet roof (eave gap), soffit vents, roof vents, ridge cap, dryer vents, plumbing stacks, louvre vents, the chimney, and any area where architectures meet, where there might be gaps. This work requires a ladder, and squirrels usually enter at roof level. Step 2 - Seal shut any openings! The primary tools I use are steel screen, a power drill, and caulk. You can install heavy steel screen over any openings, and calk shut any gaps where an area can be pushed open. I guess there really is no step three. You can trim back trees if you like, and that will discourage squirrels from jumping on to your roof, but the truth is that if there's no open areas, they can't get in. And squirrels can climb anything, so a lack of trees isn''t going to keep them away. If you do seal up the house, be sure there's no wildlife currently living inside, because then you're going to get a desperate animal who will either chew or claw its way out, or one that dies inside and causes an odor problem. What Are Other Efficient Squirrel Preventative Measures - A lot of people in the country or the suburbs are looking for squirrel preventative methods to ensure that the rodents do not enter their home. Squirrel prevention is a great way to live in the same area as squirrels without them or you becoming a threat to one another. Even people who love animals do not want squirrels in their homes because of the possible damage that they can cause. They have to keep their teeth at a certain level, and because they keep growing all their lives the most effective way to do so is to chew on things. Chewing by squirrels in your home can mean broken wires, holes in the wall and nesting in your insulation. So what are those squirrel preventatives that can be effective? You should first remove vegetation around your home. If a tree branch makes it easier for a squirrel to get into your home then you want to get rid of that branch. You should also remove small vegetation which can provide a great hiding spot for squirrels and for holes on the wall that they may be using to come into your home. Depending on the vegetation it can also be a food source; removing it will make it less likely that you will have a squirrel problem. Do it yourself: Visit my How To Get Rid of Squirrels page for tips and advice. The Eastern Gray Squirrel (Sciurus carolinensis), is one of the most widespread nuisance animals in the country. It lives throughout most of the United States. It is arboreal (likes to live in trees), but just as commonly atticeal (likes to live in attics). It's a member of the rodent family, and is prone to chewing and gnawing. Squirrels are active during the daytime, particularly morning and evening. They are active year-round. They give birth to two litters of young per year, in late summer and late winter, commonly inside buildings they've chewed into. They are very agile and great climbers, and are active animals. They are cute, but often destructive, especially when they enter an attic.